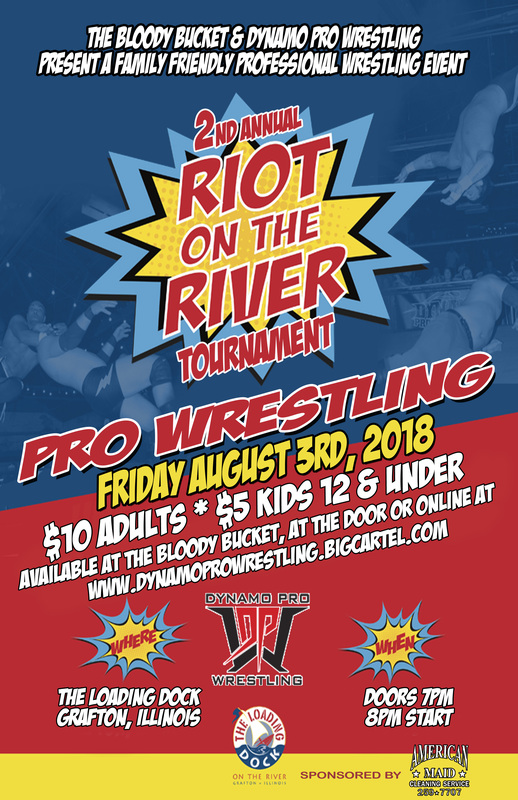 Dynamo Pro Wrestling, in cooperation with The Bloody Bucket, The Loading Dock Bar and Grill, American Maid Cleaning Service, Slackers, Aries Screen Printing, and Computer Specialists, are proud to announce that the second 2018 RIOT on the River tournament series event will be held on Friday, August 3rd, 2018. This all ages, live, professional wrestling event will be held at The Loading Dock Bar and Grill, located at 401 East Front Street in Grafton, Illinois. 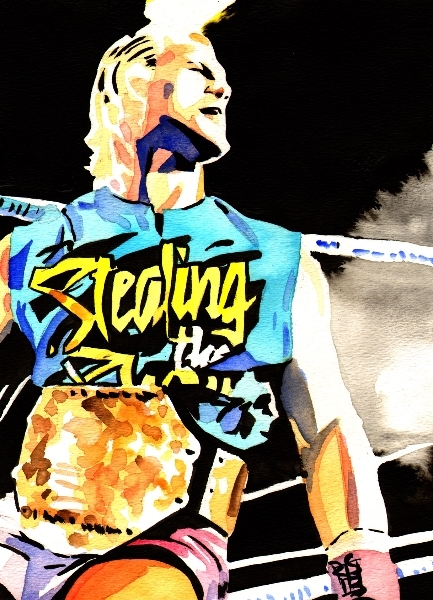 Doors will open for this event at 7:00 P.M. with a bell time of 8:00 P.M. Adult tickets are available for $10 each. Children ages five to twelve can purchase tickets for $5 each. Tickets for children under five years old are free. Advanced tickets can be purchased at The Bloody Bucket, at The Loading Dock Bar and Grill, and online at https://dynamoprowrestling.bigcartel.com. This Dynamo Pro Wrestling event will all of the quarterfinal matches in the 2018 RIOT on the River elimination tournament. In addition, after the events of the last RIOT on the River event, the Dynamo Pro Wrestling heavyweight championship will be defended as “Lights Out’ Adrian Surge will challenge the Dynamo Pro Wrestling heavyweight champion “The Wind of Destruction” Makaze. Please come out and experience the best in professional wrestling returns to The Loading Dock Bar and Grill in Grafton, Illinois. Since 2007, Dynamo Pro Wrestling has strived to bring professional wrestling fans of all ages with hard hitting, fast paced, edge of your seat professional wrestling action. For additional information on Dynamo Pro Wrestling, you can check out our website at http://www.dynamoprowrestling.com, on Facebook at http://www.facebook.com/dynamopro, and on Twitter at http://www.twitter.com/DynamoPro. For The Bloody Bucket information, you can follow them on Facebook at http://www.facebook.com/thebloodybucket. For information on The Loading Dock Bar and Grill, you can check out their website at http://www.graftonloadingdock.com, on Facebook at http://www.facebook.com/loadingdockil, and on Twitter at http://www.twitter.com/LoadingDockIL. This entry was posted on July 26, 2018 at 9:05 am	and is filed under Uncategorized. You can follow any responses to this entry through the RSS 2.0 feed. You can leave a response, or trackback from your own site.